I have the Sweetest Job around and I want to share it with you. I’m planning a fun event and everyone is invited. This is a great time to find out what Stampin’ Up! is all about. I will be sharing with you all the great benefits receive when you join my team. Plus they have a new $99.00 starter kit that I will let you know about. I know many of you may have never thought about doing what I do. However before you push it aside I challenge you to come and find out more. You may realize that being a customer is the best fit for you or becoming a hostess, a club member or coming to one of my many classes or camps. Some of you may discover that Stampin’ Up! is a perfect fit for you can and can help you earn extra income, met new people, explore your creativity and more. No matter who you are you should come and join me for this fun event. You’ll have lots of fun plus be able to make a sweet project. 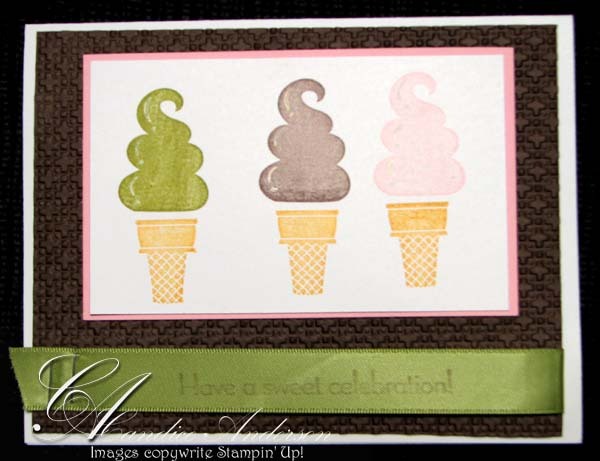 Of course with so many sweet things to choice from with Stampin’ Up! your bound to find something you love.